I first tasted Peconic Bay Scallops in the early 1990s on a weekend getaway to the North Fork. In late autumn, Barbara and I would leave our restaurant after dinner service and head east with great anticipation of visiting Charlie Manwaring at Southold Fish Market. After getting a good night's sleep we would head over to see Charlie in the early morning and would often find him still shucking the succulent meat from the scallop shells. We have since had the chance to harvest scallops in Hallock's Bay and then eat them raw right on the dock with just a squeeze of lime juice. 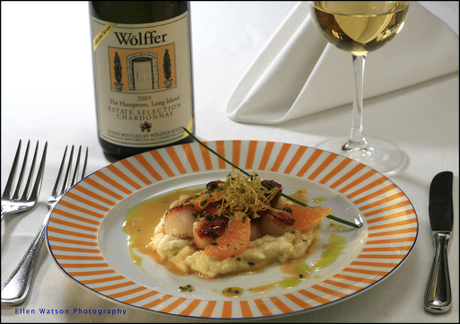 Peconic Bay Scallops are a seasonal treasure of North Fork cuisine that should not be missed when visiting the area. Charles and Barbara Smithen of Sherwood House Vineyards have created a delightful stainless steel-fermented chardonnay from fruit grown right here on Oregon Road that pairs beautifully with this chowder recipe. The razor crisp acidity and bright fruit balance the sweetness of the scallops and fresh cream, leaving your palate refreshed and ready for a second helping. In a medium saucepan, cover potatoes with salted water and bring to a boil. Boil 3 minutes. Drain and set aside. In a large saucepan, melt butter over medium-low heat. Add leeks and cook 3 minutes, until softened. Add wine and clam broth. Increase heat to medium-high; boil 10 minutes or until mixture is reduced by half. Add cream, reduce heat to low, and simmer 15 minutes, stirring occasionally. Add potatoes and simmer 7 minutes. Add scallops and simmer 3 minutes just until opaque (do not boil). Season with 1/2 teaspoon salt and 1/4 teaspoon pepper. Garnish with parsley, paprika and a sprig of dill. My assignment this time around for "Local with Local" was a pairing with Lamoreaux Landing 2008 Red Oak Riesling. This is a beautiful Finger Lakes dry riesling that has overtones of pear and lemon pith. Nice structure, mineral and lean, but Lenn will tell you more about that in an upcoming review. On with the food pairing. As I was tasting this I thought it would be lovely with an appetizer utilizing local pears -- a great way to start off a great meal! So how about a flatbread with roasted fennel, sauteed pears, arugula and shaved Manchego cheese? 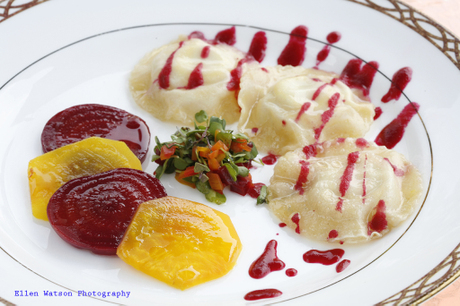 I make my own flatbread, but you certainly can purchase a flatbread and build this appetizer. Place chopped fennel on pan for roasting. Sprinkle with salt and pepper, drizzle with olive oil. Roast until soft and begins to color, about 15 minutes at 375 degrees. While roasting the fennel, in a saute pan add about two tablespoons of olive oil and begin sauteeing shallots on high heat. Reduce to medium heat and as shallots begin to soften, add pears with minced garlic and salt and pepper. Continue saute until pears are soft, but not mushy. Cool both fennel and pear mixture. On the flatbread, layer fresh arugula to cover, add pear and shallot mixture, then layer on roasted fennel (divide evenly between the three flatbreads. Shave Manchego on top and bake in oven (375) for about 10 minutes. Cut each flatbread into quarters and serve immediately with a glass of the Lamoreaux Landing Red Oak Riesling. Serves 3 to 6 people. 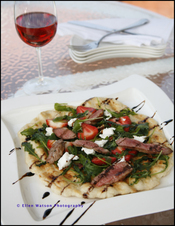 Come in and enjoy this flatbread and wine in October at the Bistro at Red Newt Cellars! Local with Local: 2 Regions. 2 Chefs. My ongoing Local with Local project is expanding beyond Long Island this summer. 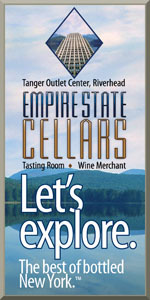 Expanding to the Finger Lakes. Deb also happens to be co-owner of Red Newt Wine Cellars with her husband Dave Whiting, who is the winemaker. A winemaker and chef owning a winery and restaurant. Sounds like a power couple to me. To side-step any potential conflicts or perceived conflicts, I will likely never ask Deb to create a dish to pair with one of Dave's wines. There are plenty of other great wines in the Finger Lakes to focus on, anyway. My current plan, if the chefs can keep up with it, is to pick one one for each of them to create a dish for per month. We'll start this Wednesday with pairings for Channing Daughters Winery's 2007 Tocai Friulano and Damiani Wine Cellars 2007 Cabernet Franc. Welcome aboard, Chef Deb. Looking forward to your contributions! I first met Doug Gulija at a chardonnay vertical tasting at Wolffer Estate a couple years ago. He came right up and introduced himself to me and throughout the tasting, I was impressed by his palate as well as his dedication to Long Island wines--both in his personal life and and at his restaurant. You may remember that when LENNDEVOURS was celebrating it's 3rd birthday a little over a month ago I mentioned that I wanted to work with some local chefs on some special food and wine pairings that bring together the best of Long Island's seasonal ingredients with local wines. We'll call it our "Local With Local" project. 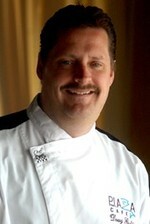 Well, I'm happy to say that Chef Gulija has agreed to sign on as my chef of the month for May. 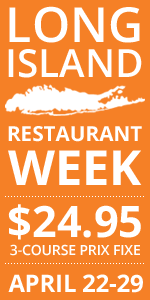 He is chef and proprietor of the award-winning restaurant The Plaza Café, located in Southampton, New York. The Plaza Cafe is known as a premier destination for seafood lovers and has been awarded three stars (Excellent) by the New York Times. 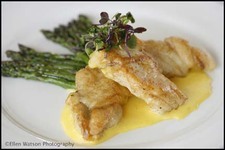 The Plaza Café has also been awarded an Award of Excellence by the Wine Spectator in 2001. Chef Gulija has been selected by the James Beard House to cook at the annual Chefs and Champagne in 1999, 2002 and 2006 where the Guests of Honor have been Julia Child, Daniel Boulud and Thomas Keller. This has lead to an invitation to cook at the James Beard House in Manhattan. Over the course of his career, Chef Gulija has cooked over seas at The Grand Vefour in Paris, the InterContintental Hotel in his homeland of Croatia as well as studying abroad in Spain and Japan. Later this month, chef and I will announce our wine pairing of the month.